A tri-partite meeting of the district administration, border roads organization (BRO) and All Arunachal Pradesh Public Transport Federation (AAPPTF) was held on Thursday at the West Kameng district headquarters here in connection with the inordinate delay in completion of the Balipara-Charduar-Tawang (BCT) road. 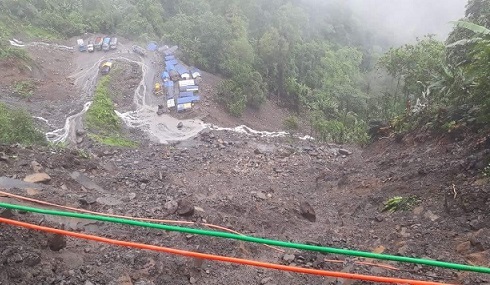 Frequent closure of the BCT road for all kind of vehicular movements have caused untold problem for the people of Tawang, West Kameng and East Kameng districts as it is considered as the lifeline for the three districts. Subsequently, the AAPPTF had called for a permanent solution to the vexed issue. Commander 14 BRTF Colonel B S Katal seeking the cooperation of the people of the three affected districts said that the BRO is well aware of the issues concerning the BCT road and assured that the road would be completed by 2021. He also said that drastic changes would be seen in the said road by this financial year ending. Earlier, AAPPTF president Dobing Sonam highlighting the issues and concerns of the people of the three affected districts raised serious concerns on the work ethics of BRO. He advocated for clearance and maintenance of the NEEPCO’s Kimi-Khuppi road by the BRO as a bye-pass road for the commuters of the three districts. “This would facilitate the BRO in its continued work on the BCT road without harassing the people,” he said. Highlighting the other side-effects of the frequent closures of the BCT road, Sonam observed that the patients and attendants are having a harrowing time and that black marketing is on the rise and there has been considerable fall in the tourist flow to the three districts especially to Tawang. Other speakers from AAPPTF also took serious note of the absence of BRO officials from duty and the dismal numbers of man and machinery in an important project of this magnitude. They called for placement of sufficient numbers of man and machineries at the work site and also expressed their concern over the absence of mixture machines and lack of safety gears for the workers. A consensus was reached between BRO and AAPPTF with the Commander 14 BRTF assuring to make a field visit to the Pinjoli-Kimi-Khuppi-Zero Point road at the earliest and to take up the matter with NEEPCO to use it as a bye-pass road till completion of the BCT road. Deputy Commissioner in-charge, B Puroik suggested for a joint sitting of the district administration, BRO, NEEPCO and the AAPPTF to find out a workable solution to the vexed issue.